What is the evolutionary purpose of tickling? You probably know that you can't tickle yourself. And although you might be able to tickle a total stranger, your brain also strongly discourages you from doing something so socially awkward. These facts offer insight into tickling's evolutionary purpose. According to Robert R. Provine, a neuroscientist at the University of Maryland, Baltimore County, and the author of the book Laughter: A Scientific Investigation, tickling is partly a mechanism for social bonding between close companions and helps forge relationships between family members and friends. Laughter in response to tickling kicks in during the first few months of life. "It's one of the first forms of communication between babies and their caregivers," Provine says. Parents learn to tickle a baby only as long as she laughs in response. When the baby starts fussing instead, they stop. The face-to-face activity also opens the door for other interactions. Children enthusiastically tickle one another, which some scientists say not only inspires peer bonding but might help hone reflexes and self- defense skills. In 1984 psychiatrist Donald Black of the University of Iowa noted that many ticklish parts of the body, such as the neck and the ribs, are also the most vulnerable in combat. He inferred that children learn to protect those parts during tickle fights, a relatively safe activity. Tickling while horsing around may have also given rise to laughter itself. 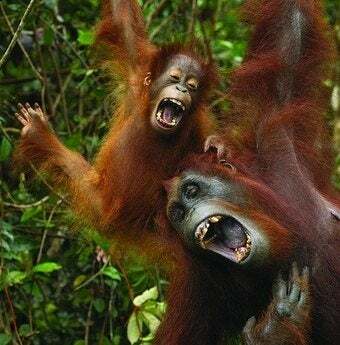 "The ‘ha ha' of human laughter almost certainly evolved from the ‘pant pant' of rough-and-tumble human play," says Provine, who bases that conclusion on observations of panting among tickle-battling apes such as chimpanzees and orangutans. In adulthood, tickling trails off around the age of 40. At that point, the fun stops; for reasons unknown, tickling seems to be mainly for the young. Photo: Thomas Marent/Getty Images. This post originally appeared on Popular Science.